WORKADAY GENIUS: In 1952, Gabriele Borel and her husband Armand Borel arrived at the Institute from Switzerland. Armand Borel would later join the Faculty in the School of Mathematics. 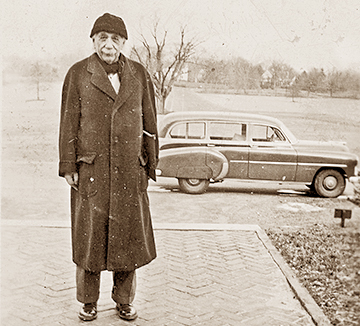 His wife, Gaby, took this snapshot of Albert Einstein as he arrived at Fuld Hall early one January morning in 1953. The Institute for Advanced Study (IAS) is celebrating its 80th anniversary this year, and to mark the occasion local author Linda Arntzenius is writing a pictorial history of the legendary home of Albert Einstein and other intellectual luminaries. The second installment of a neighborhood meeting about the future of the Olive May/West Coast Video site along Nassau Street convened on Monday evening, with about 30 residents in attendance at the Chestnut Street Firehouse. The Princeton Dinkys days may be numbered, but it will be forever enshrined in a new mural that graces the entrance to the Johnson Park School (JPS).